© 2015 Red Bull Media House GmbH – all rights reserved. Tuning up for final race of the season on Sunday in America’s gaming capital, championship leader Paul Bonhomme took third place the first round in the battle of nerves against his challenger Matt Hall, who was second in Qualifying behind Japan’s Yoshihide Muroya. Muroya will now face red-hot Nigel Lamb in their opening Round of 14 battle. 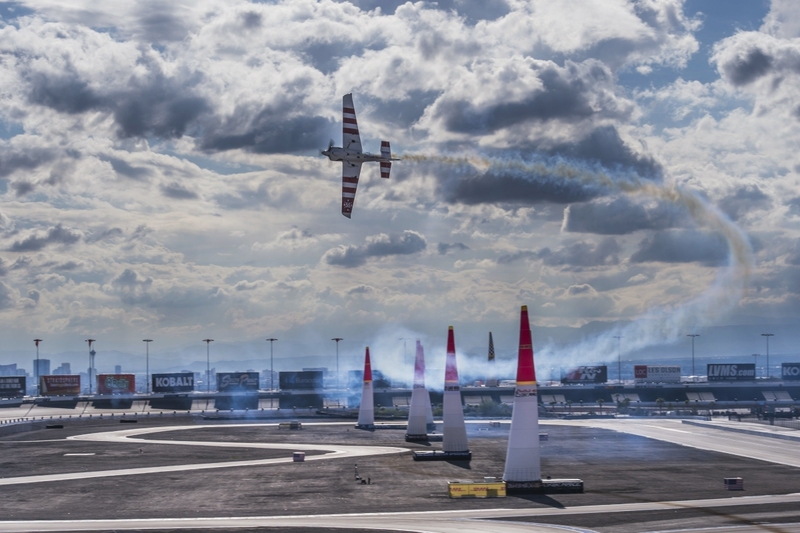 LAS VEGAS (USA) – Britain’s Paul Bonhomme finished third in Qualifying at the Red Bull Air Race on Saturday and said he was pleased with the result because it means he avoids compatriot Nigel Lamb of Team Breitling in the opening Round of 14 on Sunday in the season finale. Bonhomme needs only a fifth place on Sunday to clinch his third World Championship but said he will also be going for a fifth win in 2015. Lamb was the fastest in training on Friday but missed Qualifying after his propeller touched the ground on a difficult landing after the third training session. Japan’s Yoshihide Muroya came out on top in high-stakes showdown in Qualifying to win the honor as the fastest pilot going into Sunday’s final race of the Red Bull Air Race World Championship for the first time in his career. Muroya stopped the clock in a time of 48.618 seconds while Australia’s Matt Hall was in second place with a time of 48.853 seconds in Qualifying in the world’s fastest motorsport series, where the pilots race at speeds of up to 230 mph. By taking second place, Hall kept the pressure on Bonhomme, the Red Bull Air Race Championship leader with 67 points from the previous seven races and two-time world champion (2009 and 2010). Hall has 59 points. Hall is in the fight of his life to overtake Bonhomme, the most successful pilot in the sport’s history with 19 race victories in 10 seasons and 64 races to date. This is only Hall’s fourth season and he has 27 starts with just one victory. Bonhomme said he was pleased with his Qualifying run — especially avoiding Lamb in Sunday’s head-to-head racing. He will race rookie Francois Le Vot of France in the first round. With the eight-point lead, Bonhomme only needs the four points to clinch the 2015 world championship. Hall will need help from the other pilots to knock Bonhomme out of an early round and could only win the title if he is first (12 points) and Bonhomme finishes sixth (3 points) or lower. Hall could also win it all if he is second (9 points) and Bonhomme is ninth (0 points) or worse. Bonhomme is trying to become the sport’s first three-time World Champion. The battle for third place overall could go right down to the wire with Lamb hoping for a win to possibly put him in third overall. Five pilots still in the frame to take third. Hannes Arch (AUT) is in third now with 30 points while Martin Sonka (CZE), Lamb, Pete McLeod (CAN), and Matthias Dolderer (GER) are all within striking range with strong results down the home stretch.